This is a 3 Port USB hub charger, you can connect three of your USB compatible devices like digital camera, cell phone or flash drive while charging or syncing your iPad 1/2/3, iPhone 3G/3GS/4G/4S, iPod at the same time. Adds 3 hi-speed USB 2.0 ports. Supports up to 480 Mbps transfer rate. 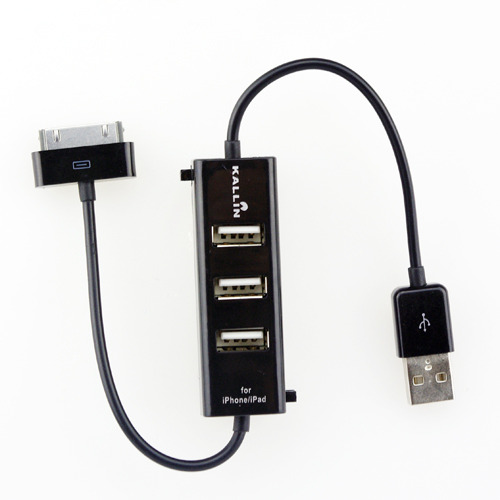 Fully compatible with USB 2.0 specification, backwards compatible with USB 1.1. Provides up to 500 mA per port. Has a DC 5V power adapter port which can provide extra power.